The Corruption Perceptions Index (CPI), which ranks 180 countries and territories by their perceived levels of public sector corruption according to experts and businesspeople, uses a scale of zero to 100, where zero is highly corrupt and 100 is very clean. 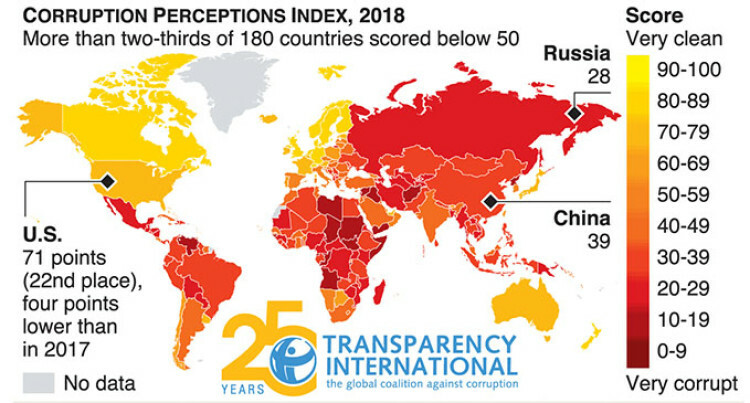 Graphic News shows selected data from Transparency International’s Corruption Perceptions Index 2018. The United States has dropped out of the top 20 “cleanest” countries for the first time since 2011, according to an annual survey released by global anti-corruption watchdog Transparency International. More than two-thirds of countries scored below 50 in this year’s report, with an average score of just 43. The United States had a score of 71, down from 75 in 2017. In a cross-analysis of its survey with global democracy data, TI said a link could be drawn between corruption and the health of a democracy. Denmark and New Zealand had the best scores on the CPI in 2018, scoring 88 and 87, while Somalia, Syria and South Sudan were at the bottom, with scores of 10, 13 and 13.